I first read this so long ago, that I do not remember reading it. Definitely written for children, Tolkien wrote this 30+ years before The Lord of the Rings. Here, the famous ring is just a magic ring of invisibility, without the dark overtones and corrupting power that it would acquire later. That is not to say that the book can't also be enjoyed by teens and adults, although I found the silly rhyming names of the dwarves to be somewhat distracting. Tolkien did go back and revise The Hobbit so that the version we have now is more in line with what he wrote later after developing the world of Middle Earth. We can imagine that perhaps this is the version of his adventures that Bilbo wrote to tell his nieces and nephews. I can definitely identify with Bilbo's conflicting needs for adventure and security. But it is through adventure, through stretching ourselves, and leaving our comfort zones, that we grow as human beings. This is also a cautionary tale about greed. I look forward to seeing what Peter Jackson has done with the movie, and I'll also be taking a look at The Annotated Hobbit. 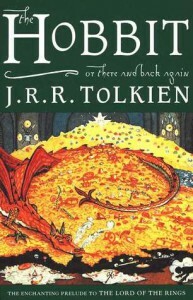 Description: A great modern classic and the prelude to The Lord of the Rings. Bilbo Baggins is a hobbit who enjoys a comfortable, unambitious life, rarely traveling any farther than his pantry or cellar. But his contentment is disturbed when the wizard Gandalf and a company of dwarves arrive on his doorstep one day to whisk him away on an adventure. 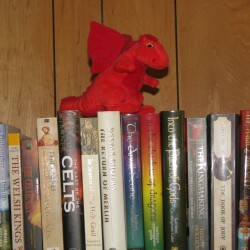 They have launched a plot to raid the treasure hoard guarded by Smaug the Magnificent, a large and very dangerous dragon. Bilbo reluctantly joins their quest, unaware that on his journey to the Lonely Mountain he will encounter both a magic ring and a frightening creature known as Gollum.